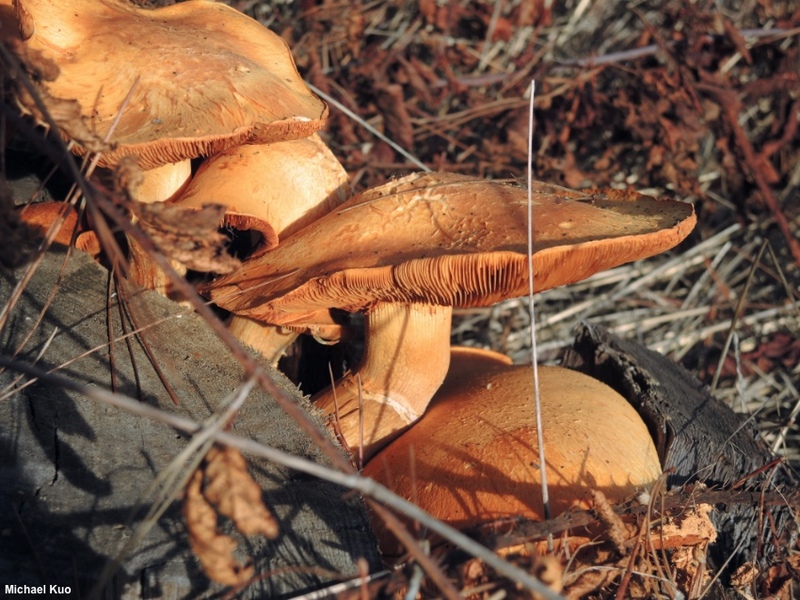 This impressive mushroom is found growing in dense clusters on stumps and logs of both hardwoods and conifers. 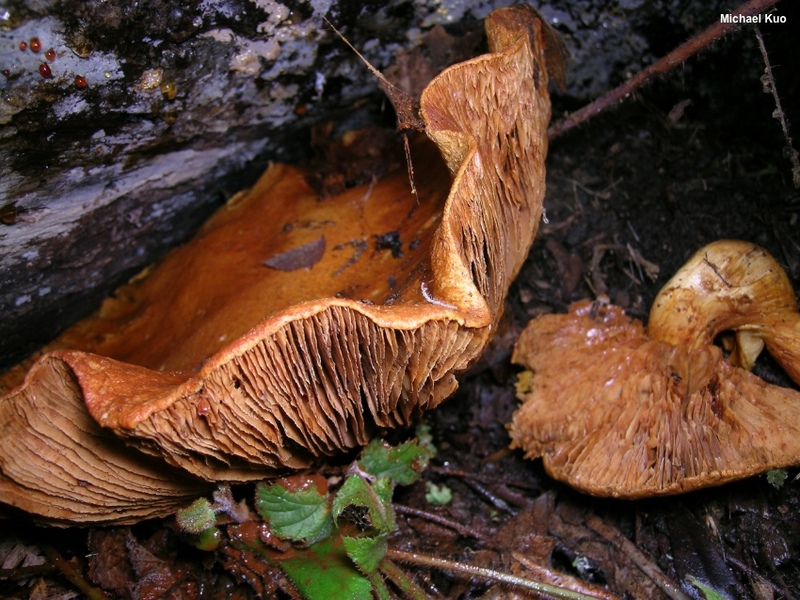 It features a fairly large cap, bitter taste, a stem with a ring or ring zone, and an orange to brownish orange spore print. In fact the "spore print" often surrounds the mushrooms in nature, and it can be quite effusive. I once ruined a pair of jeans collecting Gymnopilus junonius, when an in-situ spore print covered my legs and changed the color of the fabric, even through several washings. 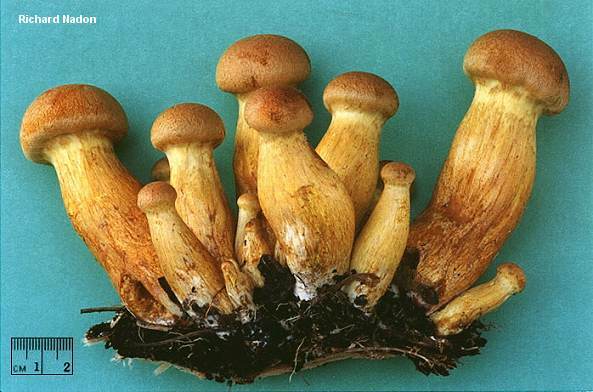 Gymnopilus ventricosus, from the Pacific Northwest, grows only on conifer wood and can reach astounding sizes (caps to 40 cm); it has a very thick stem that is often swollen in the middle and can reach a width of 10 cm. The yellowish, comparatively slender Gymnopilus luteus is found in eastern North America. Fries (1821) originally described Gymnopilus junonius (as "Agaricus junonius") from Europe. 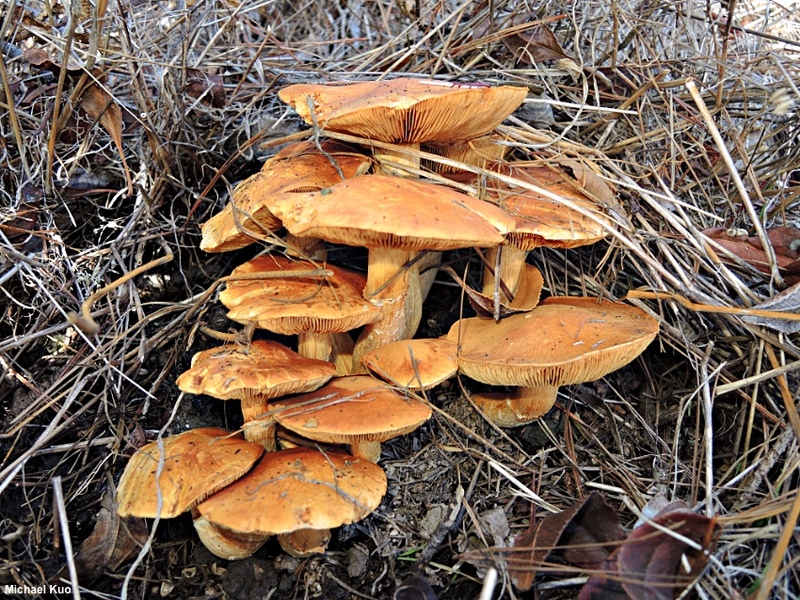 Contemporary, DNA-based study has not, to my knowledge, ascertained whether our North American versions of this fungus—which vary substantially in their ecology and morphology—deserve new names. 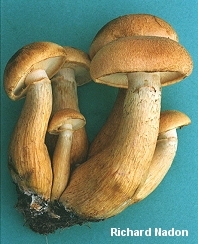 Gymnopilus spectabilis is a synonym. 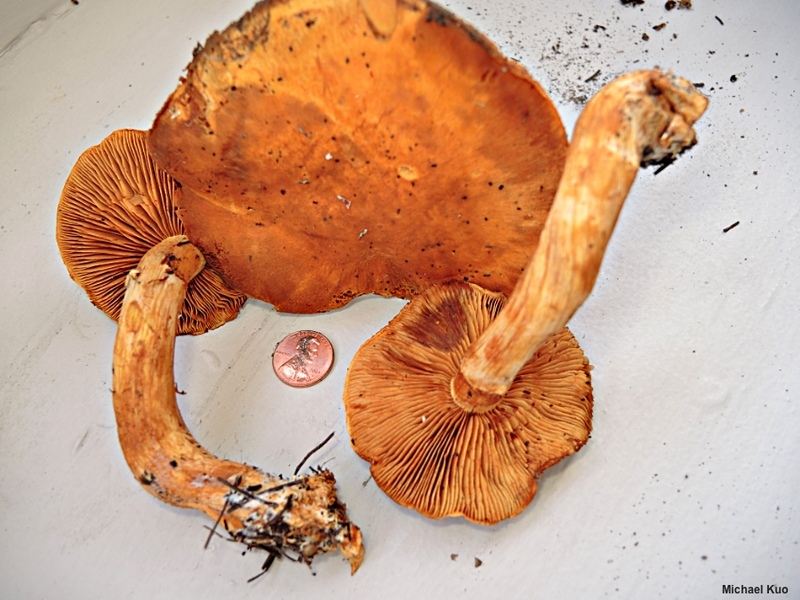 Thanks to Naomi Clarke for collecting, documenting, and preserving a collection of Gymnopilus junonius for study; her collection is deposited in The Herbarium of Michael Kuo. Ecology: Saprobic on the rotting wood of hardwoods and conifers; usually growing in clusters; summer and fall (fall through spring on the West Coast); widely distributed in North America. The illustrated and described collections are from California, Oregon, and Québec. Cap: 5–26 cm, convex, becoming broadly convex or nearly flat; dry; finely silky; brownish orange; the margin inrolled when young. 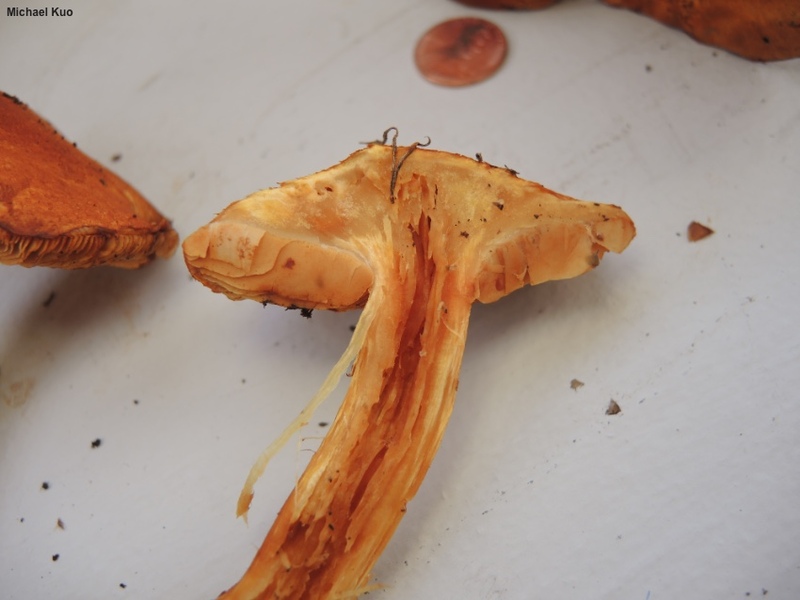 Gills: Narrowly attached to the stem; close; short-gills frequent; orangish yellow at first, becoming orangish to orange-brown; staining brown. Stem: 9–16 cm long; 1.5–3 cm thick; more or less equal, or swollen in the middle; silky-fibrillose, becoming more bald with age; with thin ring that sometimes folds outward at the top and collects orange spores; dull yellow to brownish orange; bruising brown. Flesh: Orangish yellow; thick and firm; not changing when sliced. Chemical Reactions: KOH red, then promptly black on cap surface. Spore Print: Bright rusty orange. 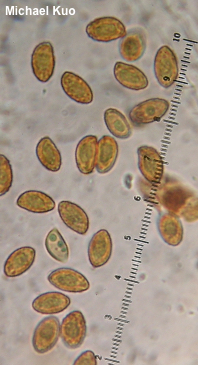 Microscopic Features: Spores 8–11 x 4–6.5 µm; subamygdaliform; verrucose; orangish golden in KOH; dextrinoid. pleurocystidia inconspicuous; basidiole-like. Cheilocystidia 25–35 x 2–4 µm; cylindric-flexuous with capitate to subcapitate apices; thin-walled; smooth; orangish in KOH. Pileipellis a cutis of encrusted hyphae 2.5–10 µm wide. Clamp connections present. REFERENCES: (Fries, 1821) Orton, 1960. (Saccardo, 1887; Smith, 1949; Hesler, 1969; Smith, Smith & Weber, 1979; Weber & Smith, 1985; Arora, 1986; States, 1990; Phillips, 1991/2005; Lincoff, 1992; Metzler & Metzler, 1992; Orton, 1993; Barron, 1999; Miller & Miller, 2006; Desjardin, Wood & Stevens, 2015; Elliott & Stephenson, 2018.) Herb. Kuo 01130502, 01121805, 10171801.